"My patients have all been extremely satisfied, to the point that they have been referring everybody that they think needs this procedure. Word of mouth has been a very stron motivation, even for patients who are on medical therapy." 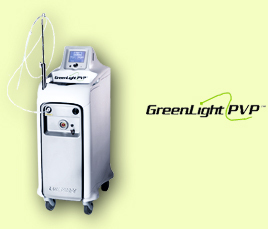 The GreenLight PV™ Laser System together with the PVP procedure (photoselective vaporisation of the prostate) for the treatment of benign prostate hyperplasia (BPH) allows urologists to deliver the clinical results of TURP without significant risks. And to do so in a minimally invasive, often outpatient procedure, that produces immediate, long-lasting relief from symptoms, which rarely require - or only short-term - catheterisation. This procedure offers a short recuperative period and very high patient satisfaction. The GreenLight PV™ Laser System is so powerful that glands of virtually any size can be treated in only one treatment session. In a 5-year follow up study, none of the patients required re-treatment. Unlike drugs or other laser and thermo therapies, GreenLight PV™ offers a real solution for BPH, rather than just a step in the management of symptoms. When opting for GreenLight PVP™, urologists no longer have to choose between an effective yet invasive surgical treatment and "minimally effective" but minimally invasive thermotherapy. GreenLight PVP™ combines the best of both treatments to deliver TURP-comparable clinical results with a minimal invasive procedure.